The apartment was absolutely gorgeous and so spacious. We fell in love the second we walked up the steps to the entrance of the building. The location was fabulous too. Location was really central, excellent facilities in the kitchen. We had a slight problem with the accommodation which was sorted out really quickly, communication with the hosts was very speedy. The staff kindly allowed us to store our luggage at the property office since we arrived several hours before check in. Check in was easy as was the security for the building. Location was excellent. About a 10 minute walk to Waverly. Access to restaurants. Queen Street is busy, however the rooms faced away from the road. We found our lodgings spacious and a very good value. Great location, could walk anywhere, transport close by. Large apartment, lots of space. The key code was simple and easy to use. The location was central. Property was in very good location adjacent to parks, lots of restaurants, stores, attractions and within walking distance to the university (25 Minutes max). The apartment is spacious, bright and clean. Large separate kitchen has larger fridge and freezer, large cooking stove, microwave, small dishwasher and washing machine. Rooms have high ceilings and it is simple but nicely decorated, carpeted rooms and lounge room make it feel warm and more homely. Beds are good size and comfortable and cozy (and warm even during cold nights). Blinds on all windows take some of the cold wind and street noise during cooler autumn days. Keyless entrance is good and there is a fast response when contacted via door intercom. Email contact worked fine. Parking is available behind the building on a tiny gated lot. The space, probably more than we needed, was very central and secure. Nice building and apartment, very spacious, huge living room! we were lucky to get the ground floor apartment as we requested before, so no need to carry the luggages upstairs. Nice location, close to everything. The Heat works very well. Bright, airy, comfortable and a great location. Swift response to email queries. Very helpful. Lock in a great price for Destiny Scotland - Q-Residence – rated 9 by recent guests! 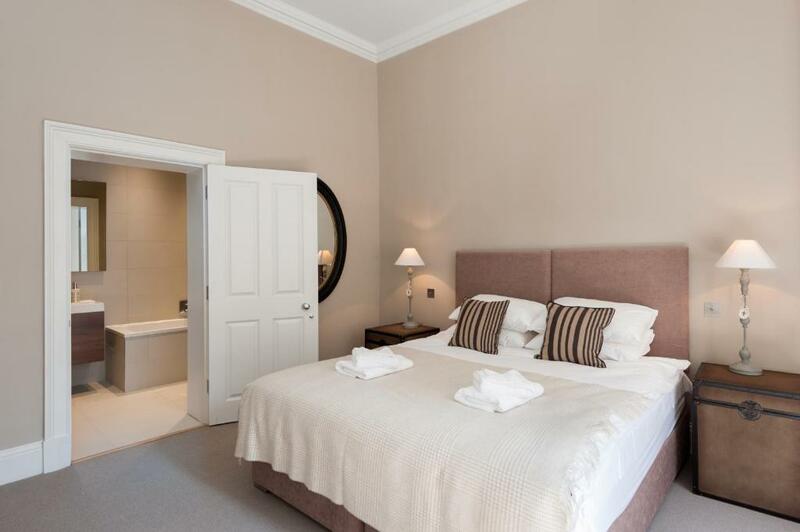 One of our top picks in Edinburgh.Located half a mile from Waverley railway station, Q-Residence offers self-catering apartments with free Wi-Fi. Edinburgh Airport is 7 and half miles away and there are regular bus services to and from the airport. Each stylish, serviced apartment features views of Queen Street Gardens, modern furniture, a spacious living room with a double sofa bed, a dining area, and a separate kitchen. A variety of bars, restaurants, shops and pubs can be found within 5 minutes’ walk from Q-Residence apartments. The iconic Edinburgh Castle with its beautiful gardens is located less than half a mile away. The vibrant Edinburgh city center is a 5-minute walk from the apartments. 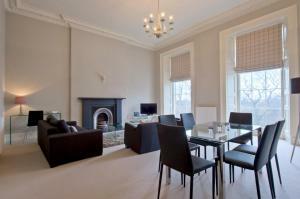 뀐 Located in the top-rated area in Edinburgh, this property has an excellent location score of 9.5! When would you like to stay at Destiny Scotland - Q-Residence? Overlooking Queen Street Gardens, this luxury apartment features stylish furniture, a spacious living room with a double sofa bed, a dining area, and a separate kitchen. It is a 2-bedroom property with a double bed in each room. Please note that these beds can unfortunately not be split into single beds. Please note that there is no elevator at this property and apartments on the ground floor can be requested and are subject to availability. Overlooking Queen Street Gardens, this luxury apartment features stylish furniture, a spacious living room with a double sofa bed, a dining area, and a separate kitchen. Overlooking Queen Street Gardens, this luxury apartment features stylish furniture, a spacious living room with a double sofa bed, a dining area, and a separate kitchen. It is a 2-bedroom property with a double bed in each room. Please note that these beds can unfortunately not be split into single beds. Overlooking Queen Street Gardens, this luxury apartment features stylish furniture, a spacious living room with a double sofa bed, a dining area, and a separate kitchen. It is a one-bedroom property with a double bed in each room. Overlooking Queen Street Gardens, this luxury apartment features stylish furniture, a spacious living room with a double sofa bed, a dining area, and a separate kitchen. It is a 2-bedroom property with a double bed in each room. There is also and additional mezzanine level, open space with a further 3rd double bed. With the 2 double bedrooms, sofa bed in the living room and additional double bed this apartment can accommodate up to 7 people. Please note that there is no elevator at this property and the deluxe apartments are on the 3rd floor. This luxury apartment features stylish furniture, a spacious living room, a dining area, and a separate kitchen. It is a 3-bedroom property with a double bed in each room. House Rules Destiny Scotland - Q-Residence takes special requests – add in the next step! Destiny Scotland - Q-Residence accepts these cards and reserves the right to temporarily hold an amount prior to arrival. Please note that the full amount of the reservation is due before arrival. Destiny Scotland Ltd. will send a confirmation with detailed payment information. After full payment is taken, the property's details, including the address and code entry will be emailed to you. Please note that each apartment is serviced once a week for stays longer than 7 nights. All children are welcome. There is no charge for a crib. Extra beds are available in some apartments for an extra cost of GBP 15 per night. Please note that there is no elevator in the building and apartments are accessible via stairs only. Please notify the property prior to arrival if you wish to be allocated on one of the lower floors. Please note that the full amount of the reservation is due before arrival. Destiny Scotland Ltd. will send a confirmation with detailed payment information. After full payment is taken, the property's details, including the address and where to pick up the keys, will be sent to you by email. There was a funny smell. Nice rooms, big and spacious and tidy. Nice decor, great location. Easy to access with codes. I loved everything about the apartment. It was clean, it was spacious, it was nice and bright and open and the beds where so comfy I didnt want to get out of it! Dirty I n bathroom not enough toilet rolls. Not enough dishwasher tablets. Great location with plenty of shops, bars and restaurants nearby. Cleanliness, noisy apartment with maintenance issues. Our stay at this hotel was not great. Although the apartment itself was spacious and lovely, there were issues with cleanliness and maintenance. I have limited mobility and on the second day of our stay here someone had literally ripped the end of the banister off the staircase and so I had nothing to hold on to as I climbed the stairs. There was no attempt by staff to fix this during our stay. They also leave luggage and bags of laundry tossed in the corridor of the main entrance. Certainly not a good impression. The apartment would have been great if cleanliness issues and maintenance had been addressed. A lot of the plugs in the apartment didn’t work. Nice spacious apartment. Great location. An excellent property. Spacious, clean, finished to a high standard. A great base from which to explore Edinburgh. 3 bedrooms Apartment is quite big and equipped with everything we required. Very central, walking distance to all attractions. Very clean. No keys required as it was pass coded.